In March 2002 we tasted a crisp, light wine from a vessel in the winery. Grapes from which the wine was being produced had been harvested too early. It was nice, but most suitable for producing sparkling wine. And this is exactly what happened. A “secret” wine was produced. It was something totally new, only very few people were aware of its production before its launch on the market. The wine is named after Petrarch’s most significant work written in Latin “Secretum meum o De Secreto conflictu curarum mearum” (“my painful secret inner conflict”). The work is about a dialogue between two people: the poet and Saint Augustine. A third figure, “Truth”, a dumb woman, is on the scene, too. Petrarch considers his grief, “l’inexpletum quiddam”. He feels he is incomplete, which is caused by four emotions, “quadriceps monstrum”: fear, lust, pain, joy. He is aware of his sins, mostly lustful ones and realizes he cannot be fine because of his chains of love and glory, from which he cannot be set free. 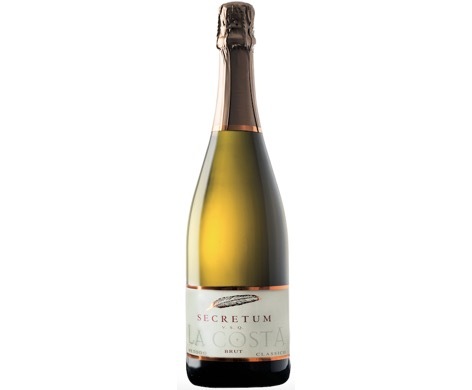 A very interesting theme for a fascinating, intriguing, sensual sparkling wine. Grapes are harvested before being completely ripe, as the content of alcohol is to be lower than 10.5- 11°. Grapes are placed in wooden boxes which are then carried to the winery, where they chill in a refrigerating cell until they reach a temperature of 7-8°. They are softly pressed by means of a pneumatic press and the must is kept in a steel vessel for 12 hours to become clear at a monitored temperature. After decanting, it ferments at a monitored temperature of 18-20° C. Wine is filtered and rendered suitable to re- fermenting by means of additional selected yeasts and sugar. It is bottled with a peculiar cork. It is kept in the winery for at least 24 months. At a specific moment all the solid remaining of re- fermentation are cleaned off from the bottle. After the degorgement, the cork is placed on the bottle and the wine is stored for a few months before being launched on the market. Nose: a complex fusion, with inviting fruity and honey-like scents, where even the less perceived notes are prominent. Enjoy this wine with some appetizers and during the whole meal. Very delicate when associated with vegetables and fish. Full bodied if drunk while eating meat dishes. What else could you expect from a wine?